Until recently, nursing environments were often your only choice for 24-hour supervision to keep the person with dementia safe. A wonderful living option is waiting for you and your family to discover…The Gardens of RidgeStone! 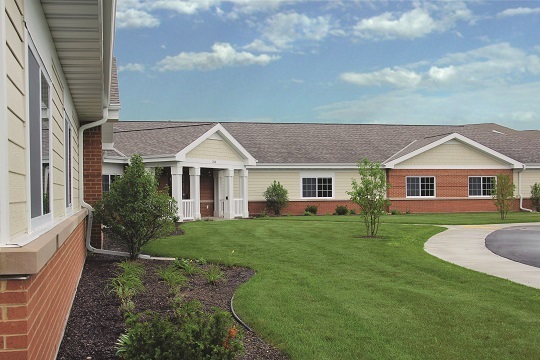 This unique combination of a CBRF (Community Based Residential Facility) and Memory Care, offers a seamless offering of community in a beautiful building. Each wing has its own dining room serving three nutritious meals each day and a unique color palette, creating a recognizable location for residents. Memory shadow boxes at every door, allow families to create a familiar, personal welcome at each room. Each room has private bathrooms and showers. Natural and Sundowners evening lighting support calmness of mind and spirit. Life Skills stations, Memories of Yesteryear TV, and activity programs, are part of RidgeStone’s vision of providing a rich life for everyone who lives here. Research is proving the vital link between mental stimulation and slowing the process of Alzheimer’s, and computer related activities can provide excellent stimulation. Therefore RidgeStone provides "It's Never Too Late," (IN2L) technology at The Gardens. Learn more about this specific, useful technology. Click here. Safety is a serious concern for families. The Gardens of RidgeStone is equipped with a state-of-the-art paging system, accessible to all residents 24-7. Wander Guard is available for anyone who has a meandering spirit, alerting staff when close to an exterior door. Outdoor access to enjoy the Gardens, is beautifully fenced. RidgeStone’s highly skilled caregivers and nursing staff, provide for each stage of your loved one’s life, including routine daily activities like medication monitoring, meals, housekeeping, bathing, dressing and more. The Gardens has a high staff to resident ratio. Staff are all trained specifically in Alzheimers/Dementia Care, led by Administrator Christina Kiesel. The continuity of living here, allows people to move from one area of care and programs to another, without leaving the RidgeStone campus. The smiling faces and caring hands remain familiar and loving, no matter what services are needed. Family is essential. Therefore events, programs, and areas for fun are designed into the schedule and building. Every detail is framed to enhance your loved one to leading a loving, secure, stimulating, happy life. The Gardens at RidgeStone is a Community Based Residential Facility (CBRF). #1 – Memory loss that disrupts daily life. #2 – Challenges in planning or solving problems. #3 – Difficulty completing familiar tasks at home, at work or at leisure. #4 – Confusion with time and place. #5 – Trouble understanding visual images and spatial relationships. #6 – New problems with words in speaking and writing. #7 – Misplacing things and losing the ability to retrace steps. #8 – Deceased or poor judgement. #9 – Withdrawal from work or social activities. #10 – Changes in mood and personality. If you have questions about any of these warning signs, the Alzheimer’s Association recommends consulting your physician. Early diagnosis provides the best opportunities for treatment, support and future planning. Learn more, click here.